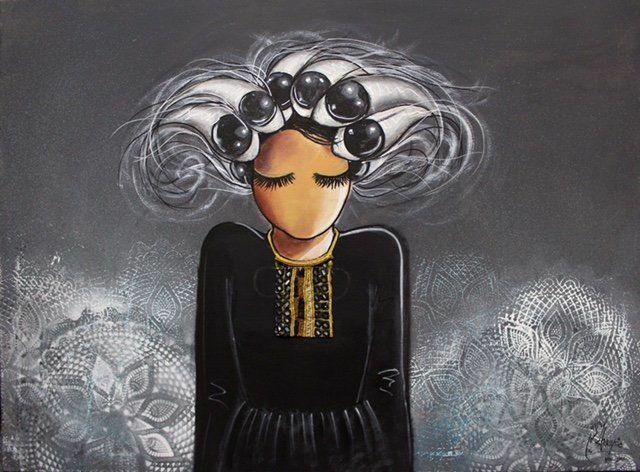 Shamsia Hassani hopes her work inspires younger Afghan citizens, both men and women, to create. At 22 years old, Shamsia Hassani became interested in graffiti ― spray painting the surreal visions fostered in her imagination onto empty city walls. Her family was supportive yet worried, and understandably so. Street art is a risky endeavor in itself, but for a young woman based in Kabul, Afghanistan, the possibility of harassment and abuse was real, if not inevitable. And so she made the city of Kabul her canvas, adorning its public, blank spaces with vibrant depictions of young women ― somewhere between self-portraits and universal renderings of sensitivity and strength. Often her subjects are pictured playing instruments, daydreaming, or wandering through the city streets. Sometimes piano keys or skyscrapers blend into the women’s dresses and hijab, emphasizing the proximity between environment and personality, as well as reality and fantasy.